Tesla short seller Andrew Left of Citron Research reveals Tuesday he is now betting the stock will rise when the company reports earnings on Wednesday. 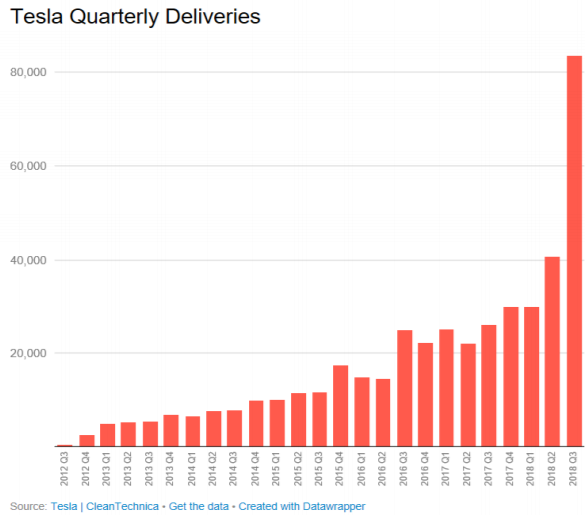 "Plain and simple – Tesla is destroying the competition," Left said in a blog post. Left confirmed that he is still suing Tesla, despite changing his stock position. Tesla shares popped as a noted short seller, Andrew Left of Citron Research, said he is now betting on the stock ahead of the company's earnings report on Wednesday. Left's firm has held a short position on the stock for more than two years, and he confirmed he is still suing both Tesla and CEO Elon Musk. The shares closed up 12.7 percent on the day at $294.14 a share, as the rest of technology-related stocks were under heavy pressure. 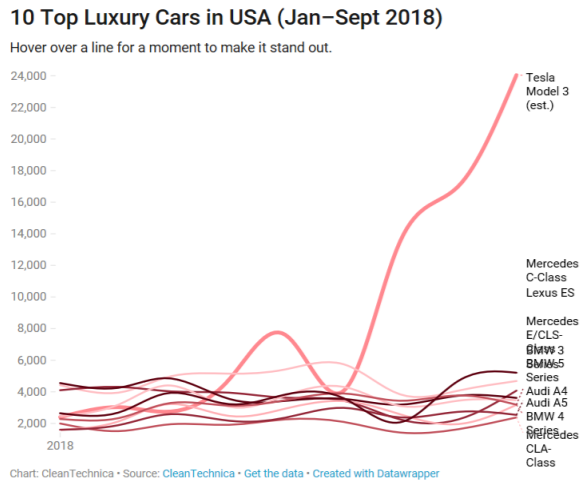 "Citron is long Tesla as the Model 3 is a proven hit and many of the TSLA warning signs have proven not to be significant," said Left in a blog post Tuesday. "Plain and simple – Tesla is destroying the competition." "TSLA is not just pulling customers from BMW and Mercedes but also from Toyota and Honda. Like a magic trick, while everyone is focused on Elon smoking weed, he is quietly smoking the whole automotive industry," the short seller added. Left presented several charts to illustrate why he believes in Tesla's dominance, citing data from the company and an electric vehicle promotional website. "Tesla appears to be the only company that can actually produce and sell electric cars," Left said. The investor revealed a short position in Tesla in March 2016, saying the stock would be cut in half from its level of $180 a share at the time due to "supply and demand problems." Left remained short over the last two years and said on Sept. 28 he thought Tesla was "a difficult short" position. "Citron has learned from our mistakes and sought to see what these shareholders find attractive — and we have," Left said. 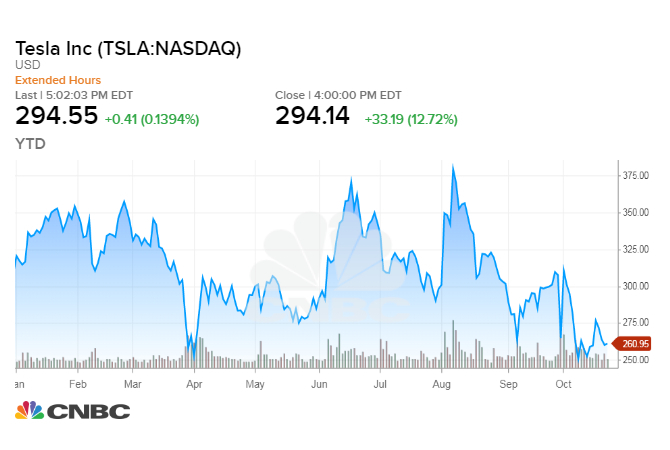 Tesla stock has had a volatile year thus far, swinging as much as 20 percent down in October after rising as much as 20 percent in August. Shares of Tesla got a boost from Musk settling fraud charges with the Securities and Exchange Commission on Sept. 29, which brought to a conclusion a saga that began in early August. Another activist fund declared Tuesday it was buying Tesla stock ahead of the company's earnings report, with Richard Pearson's Mox Reports saying in a tweet that he thinks "numbers will be blowout." Pearson said shares of Tesla will go above $300 after the earnings report. "Yes, we are still suing Musk and Tesla and this recent report has no bearing on the current lawsuit," Left said. Left's lawsuit alleges Musk manipulated the price of Tesla stock with materially false and misleading information. Specifically citing Musk's infamous Aug. 7 tweet about taking Tesla private, Left's lawsuit alleges Musk saying that funding for the company was "secured" is "a textbook case of fraud." "We believe Musk attempted to manipulate the price of Tesla securities with false and misleading tweets, in a directed effort to harm short-sellers," Left's lawyer said in a press release.